TOP: Chief hearing officer with the Office of Hearings and Appeals, Richie Nez, listens to attorney for Dale E. Tsosie, David Jordan speak at the hearing for Navajo Nation presidential candidate Chris Deschene is fluent enough in the Navajo language on Friday in Window Rock. 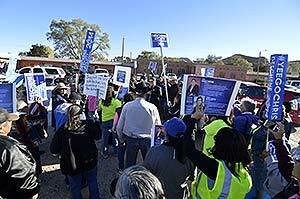 MIDDLE: Navajo Nation presidential candidate Chris Deschene, center, speaks to his supporters who marched through Window Rock to show their support on Friday morning outside the Office of Hearings and Appeals in Window Rock. Deschene's critics have argued that he is not fluent in the Navajo language, therefore, not qualified. BOTTOM: Navajo Nation presidential candidate Chris Deschene, right, listens to his attorney Brian Lewis argue on his behalf on Friday in Window Rock. The chief of the Office of Hearings and Appeals has refused to dismiss the grievance against Chris Deschene alleging the presidential candidate is not fluent in Navajo. 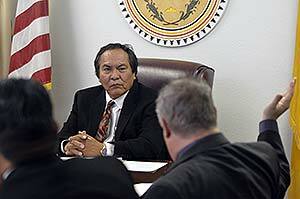 Chief Hearing Officer Richie Nez, instead, ordered Deschene to give a deposition on Monday in Navajo. The deposition will take place at the law office of David Jordan, the attorney for Dale E. Tsosie, who filed the grievance. Deschene is expected to answer questions in Navajo. Then the Office of Hearings and Appeals is expected to hold another hearing. "As this case continues to be dragged out, the core fundamental issue is being overlooked. 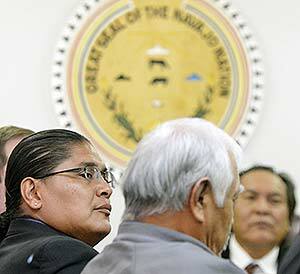 It's very simple: The people of the Navajo Nation deserve to be heard." He says that the voters spoke loudy in the August primary election by selecting him to be in the November General Elections. "I am the only candidate with a plan to preserve and protect our culture and language. This is our shared responsibility and will be a priority of my administration. I want this court case ended, and I want our people to decide. " For a more in-depth story, grab the next edition of the Navajo Times newspaper. The newspaper of the Navajo people.